Red, White, Blue, + Giveaway! Happy Fourth of July! I hope you’re able to enjoy some sun, some good food and good company today! We’ll be heading over to hang out with my parents with our little fox-dog in tow. My parents have a habit of looking forward to these sorts of holidays so that they can splurge on hot dogs and other bad-for-you foods. I hope one day I have half as much discipline about eating healthy as they do. Since I missed out on posting an outfit last week, I thought I’d share two. 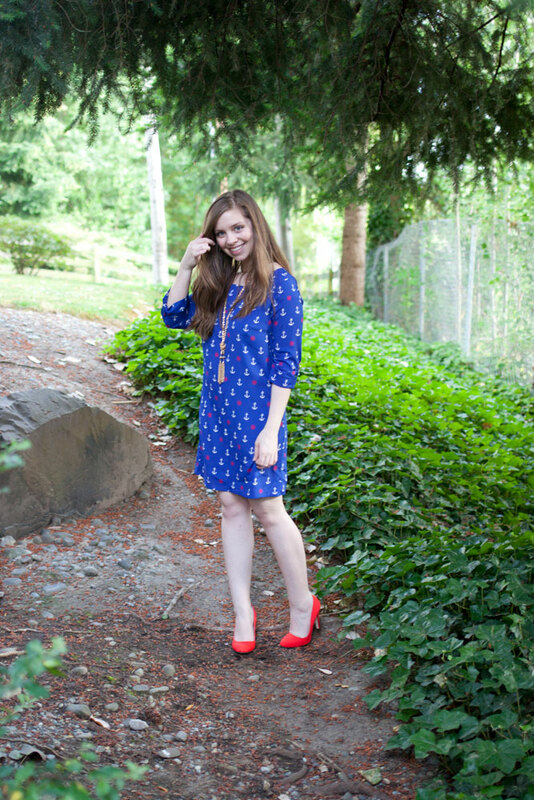 A dressy red, white, and blue anchor print dress that I absolutely am obsessing over, and a fun tie-dye maxi. You guys are probably so bored with seeing my Birkenstocks. I’m sorry, but not only do they go with all of the things, they are also so comfortable. Maybe I should just get another pair to diversify. Ha. What are you up to for the 4th of July? Happy Friday! Sounds like a good plan, did you get anything good? Thanks for entering, Kelly! For 4th of July we are going to go in town and watch the fireworks since there is a ban of fireworks on base . Haha yep, and its totally what I wore. 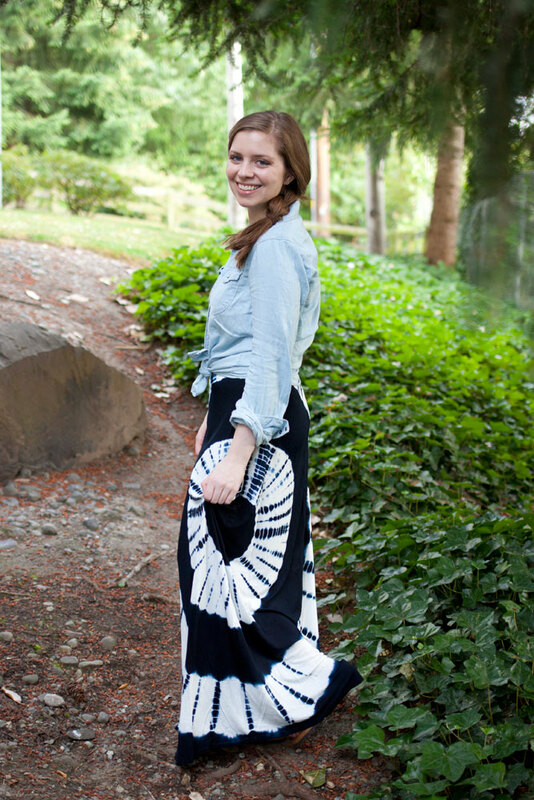 Maxis are the best when there is eating involved. Hope you had a good 4th, Lisa! Hi! For the 4th I’m heading out to my apartments’ pool for a few hours & going to the fireworks tonight with a friend. (If it doesn’t rain.) Nice and relaxing! Thank-you for this fun giveaway! sounds like a fun day! thanks for entering, Natalie! We’re grilling food and then taking our daughter to see fireworks over the river. Sounds like fun! Thanks for entering, Alisha! I love the red, white, and blue! Too cute. Thanks for linking up! Your link is broken though–oops! oops! good catch. all fixed! Sadly, I’m hanging out by myself this 4th. I took myself out to lunch, had a root beer float, and did some shopping. Lovely … but a little lonely. I am watching fireworks & reading. Sounds like a perfect evening to me! Good luck, KV! Those pumps are perfect with the anchor dress! I’m at home with The Wolfman, Netflix, and a giant bowl of gelato! Thanks, Kristan! :) Hope you had a good 4th! Thanks, Abigail! Hope you were able to catch a fireworks show, what a bummer about the rain! LOVE that first dress! Thanks for hosting the giveaway! I am loving that anchor dress! Such a classy choice for the 4th of July. Omg I absolutely love that dress! I’m a little obsessed with those shoes. We went to my sister’s in the morning so our kids could play together and had lunch there, came home for nap time, then went over to my parents’ house where we had dinner and did a TON of fireworks. I managed to wake up without a hangover, but with a few bug bites and a light sunburn on my shoulders. It was totally worth it. Sounds like a fun day! Thanks for entering, Breenah! These outfits are so cute! I love those red pumps and the maxi skirt! I love both outfits, my favourite is the first. We are grilling out with family and friends. Sounds fun! Thanks for entering, Holly. Thanks, Abby! Sorry, this one is US-only, as well. I hope to offer international giveaways in the future, but a lot of small businesses aren’t set up to ship internationally. Thanks so much for your interest! We spent a quiet day at home by the pool. It was so very hot that a tall, icy cocktail was the order of the day for us. Sounds like a great way to celebrate, Barbara! Canadian here so it was just another Friday for us :) I love that maxi!! Just spending the day with my fam! LOVE that dress on you! Sounds like fun, thanks for entering Cynthia! You look great. LOVE the dress!!! Aw, thanks so much Jo-Lynne! Anchors are part of my love language! You look beautiful! We celebrated with our parents. Good food and good company! Aw, thank you Esther! Good luck! Absolutely love all the outfits! Hope your 4th was great! We just relaxed with family poolside, with a BBQ. Both outfits look really good on you! Hope you enjoyed your stay with your parents! Thanks, Joanna! We did! I hope you had a great weekend too! You are TOO cute. Those red shoes are darling. I love the dress and the necklace! I ended up having to work on the 4th, but before i went in to work I had some lunch and snuggled my nephew! I love both of these outfits! Aw, bummer you had to work! Glad you got some family time in first though. Thanks, Miranda! I celebrated Independence Day by visiting the Jamestown Settlement, where the first British colonists landed, and Williamsburg Winery. Sounds like fun! Thanks, and good luck, Heather! I watched fireworks from my house since I live right by a lake! It was great and relaxing. Sounds like a fun day. Thanks for entering, Leslie! Jenn–I love your blog. I am a new follower via bloglovin and twitter. I absolutely love that dress!!! Hope you had a fabulous holiday! We stayed at home watching the incredible fireworks in our neighborhood! It was an amazing show right from our driveway! Sounds fun! Thanks for entering, Rita! We celebrated by spending time in our own yard – we just bought new comfortable patio furniture and a fire pit. Smores, drinks, and the neighbors fireworks – we had a great show! sounds like a ton of fun! jealous of your fire pit with smores, I’ve been dying for smores this summer! We had a big family bbq at my parents’ house on the Fourth of July. We had a barbecue with friends and lit fireworks. I watched the fireworks on TV like I usually do. I spent the 4th of July getting engaged! 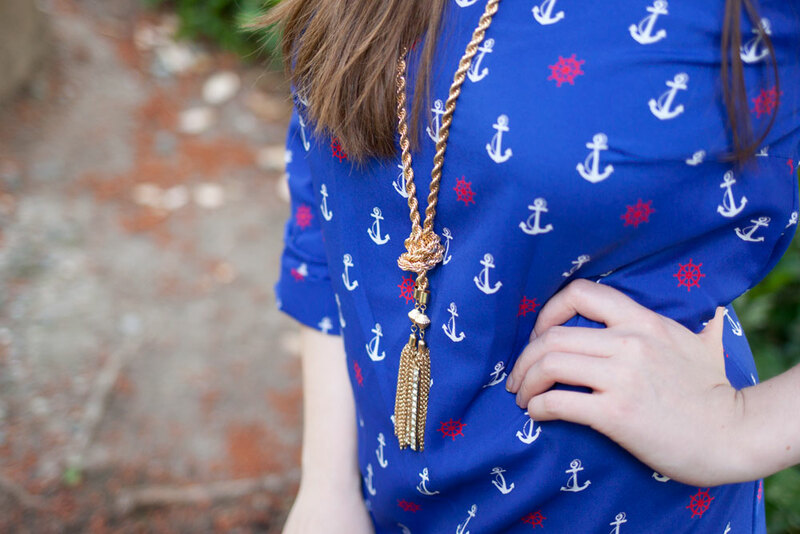 :) The first thing I thought when I saw this amazing anchor dress is that it would be perfect for engagement photos, especially because my outfit had anchors on it during the engagement! I went to my cousin who had a family cookout for the 4th. sounds fun, thanks for entering Maria! We had a family BBQ! sounds fun! good luck, Nancy! we went and saw fireworks on fourth of july! thanks so much! sounds fun, thanks for entering, Courtney! I didn’t get a chance to do anything for the fourth because we got rained out, but the weekend happened to be my anniversary weekend so Saturday night we went out for a nice dinner and Sunday we went to Universal to experience the new Diagon Alley. oh what a bummer! sounds like you had a fun weekend – so jealous you got to go to Diagon Alley! My husband and I stayed at home and did a little beer tasting. Luckily, my neighbor was big on fireworks so we were able to join in on the fun. sounds like a good time! thanks for entering! I spent the 4th on Nantucket! Sounds like fun! Good luck, Alex! this 4th we had a low key gathering of good friends – it was excellent!! Sounds fun! Good luck, Heather! Sounds fun, Megan! Thanks for entering! sounds fun! good luck, Nicole! I went to my cousin’s wedding! Oops already past but Red White and Boom in my city! :) Loveee this dress! haha, no worries :) sounds like fun and good luck, Shane! Fireworks, friends and more fireworks! On the 4th of July, I stayed at home and spent time with my family. It is one of the rare times we are all together.